"There is no greater privilege for me than to help someone achieve their dreams and goals... I spend my career as a goaltending coach doing just that. Whether it's an NHL level goalie working to hoist his first Stanley Cup, a promising up-and-coming young prospect trying to break through to the next level, or a house leaguer in search of that elusive first shutout... my #1 goal is to give back to the goalie community by teaching, motivating, and inspiring you toward YOUR next level of personal growth." 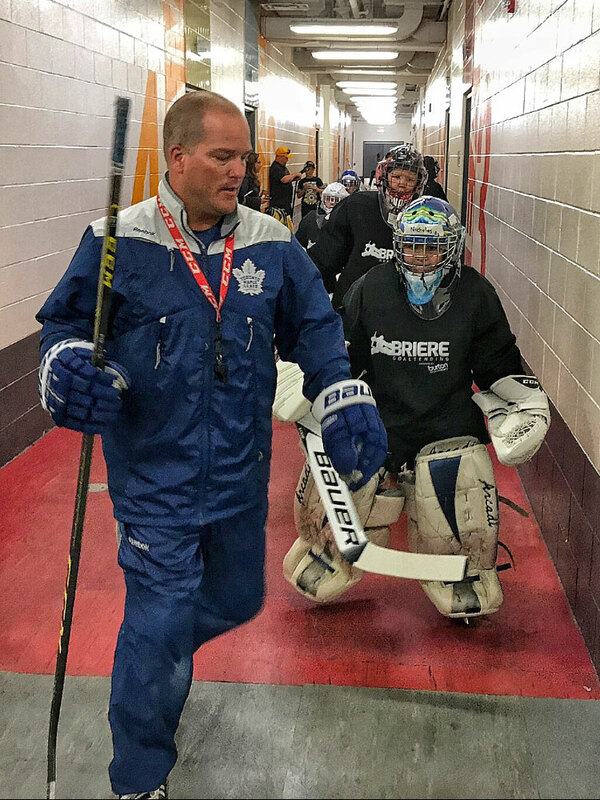 On-ice training with Goaltending Coach for the Toronto Maple Leafs, Steve Briere - Steve is the Head Instructor for ALL camps and is on the ice for ALL on-ice sessions. Impressive team of professional on-ice coaches with coaching/playing experience in the NHL, CHL, NCAA, USHL, NAHL, AHL, ECHL, and international hockey. Low goalie-to-instructor ratio to ensure maximum personal attention for each goalie. Off-ice training with a professional fitness trainer. Video training using actual NHL level video. Performance mindset and mental strength training with a certified professional. EXCLUSIVE brain speed technology and training system used by professional athletes around the world. Full day camp format from 8am-4pm each day. Post-camp online access to advanced development techniques and training programs used by NHL goalies, developed by NHL goaltending coaches Steve Briere (Maple Leafs), Mitch Korn (Capitals), Jacques Caron (Devils). "...just wanted to take a moment to thank you and your team for hosting an excellent camp." "Kyler had a fantastic time and he picked up some valuable tips." "...the communication from you and your team leading up to the camp was great." "The whole experience was excellent...We are very much looking forward to being there again next year." "Great day at camp... He's loving it!" "Our son Joshua is having an amazing time. He's already asking about next year!!" "Unbelievable goalie coach, character and loves being out there with the kids!!" "Awesome camp so far. Milton boys want to go back next year!" "Love it I'm totally coming back next year." "Very positive experience for my daughter." "The different drills every day made Benjamin improve so much and learn things in a different manner." "Fast pace and well organized." "The planned sessions were excellent. On-ice, video, dry land and fitness." "I liked that there was one-on-one time with Steve..."
"The structure was fantastic and it seemed to roll through the stations rather smoothly..."
"I was impressed with the mental strength aspect..."
"Really liked the communications back and forth ahead of the training." "We liked everything about this camp. We were so impressed with the organization, the skills being taught, the coach to goalie ratio, and just the friendliness of everyone there, especially Steve." "...want to thank Steve for being so encouraging to our son, we will definitely be back next year!" Ever wanted to learn from an NHL goaltending coach? Now you can. Limited spots are available in the mentorship program.